I love making pretty individual desserts. They seem so personal and gives the impression that someone took the time to make something special just for you (me). 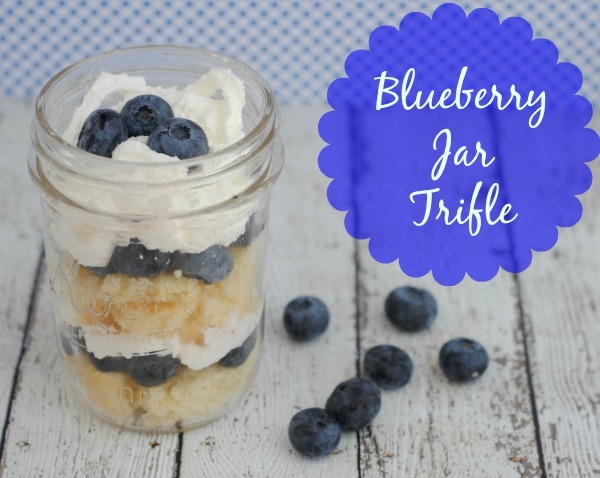 I like trifles and they are perfect to individualize by making them in a jar. 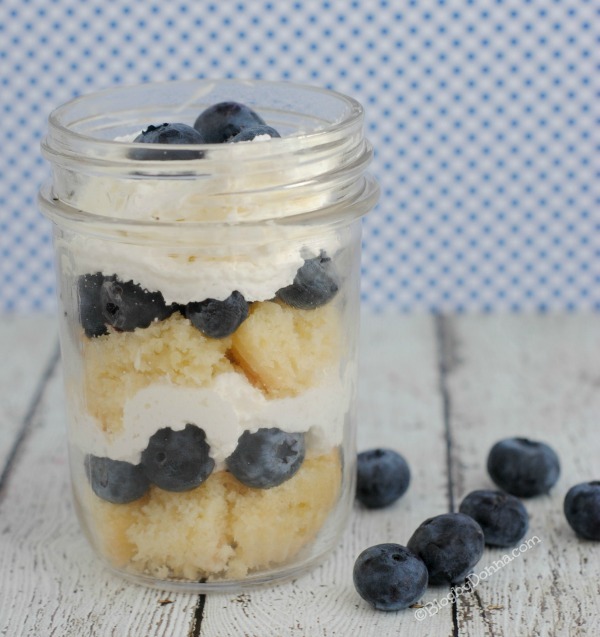 Since blueberries are one of the super foods, they make great trifles. Combine the sugar, butter, vanilla, milk and eggs and mix well. Stir in flour and baking powder. Mix well. Pour batter into greased and lightly floured 9×13 baking dish. Bake for 25-30 minutes. Let the cake cool completely by placing it in the fridge for a few hours. Once the cake is cool, remove it from the baking dish and cut into small chunks and set aside. Next, rinse your blueberries. Finally, you can begin layering your jars. Start with a layer of cake, next add a layer of blueberries and then a layer of repeat cream. Repeat. Top with whipped cream and some extra blueberries on top. Repeat this process with the other jars. *Serve immediately. I don’t recommend storing them because of the whipped cream although you probably could leave in the fridge a few hours prior to serving. Makes approximately 20-24 jars. (1) 8 oz. jar = 1 serving. 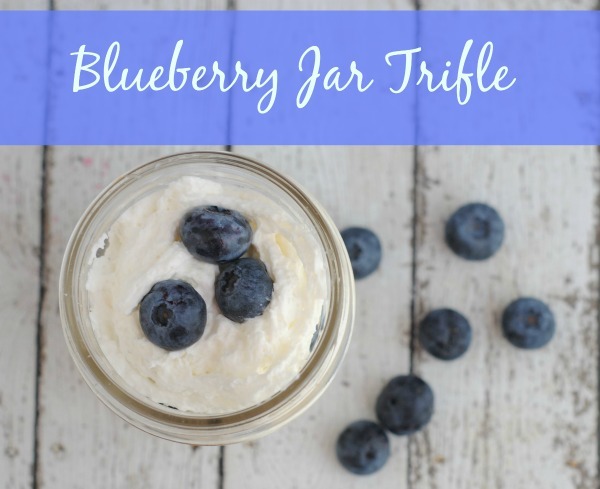 I hope you try this Blueberry Trifle in a jar… I think you’ll find it a big hit with your guests! What’s your favorite dessert to serve at parties or family gatherings? Oh that looks refreshingly light for a summer dessert! I love fresh blueberries on just about anything. I don’t really make a lot of summer desserts, we usually just eat fresh fruit, but I do like a frozen pie or cake when we grill out or need to bring a dessert to a friend’s gathering. I honestly don’t have a favorite desert that I make for gatherings. I have plenty of favorites that I like to enjoy at events. I am normally the one who brings a main course item. This looks really good. Looks delish. I love eating things out of jars. This sounds like an amazing Spring treat. Fresh blueberries are so delicious! I love this idea! I’m always looking for new desserts for camping and I think this would be great! Oh goodness that looks heavenly!!! I am so gonna have to make this, yum yum! I love blueberries! What I serve at gatherings depends on my mood, what I have on hand or how quick and easy it is. This looks really, really good! I’m always getting request for my red velvet cake, banana pudding, caramel cake and banana cream pie. I make them at least five times a week for functions and other events. I love having strawberry pound cake! that looks so good, i love a good blueberry desert! 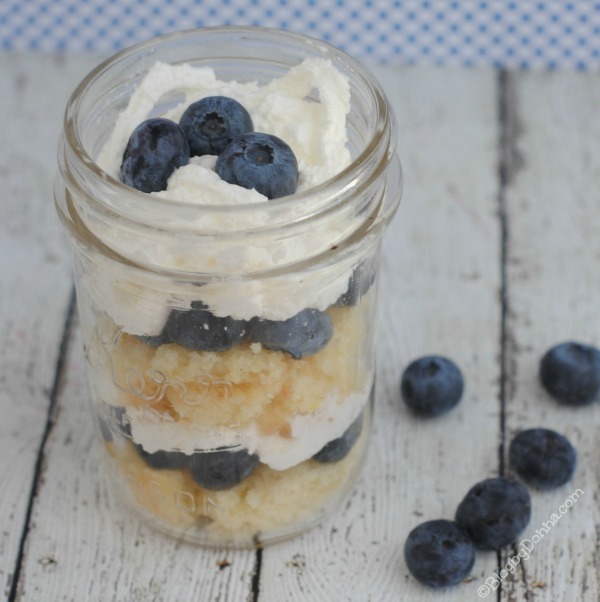 This blueberry jar trifle looks delightful! I’ll have to try this soon. I love Trifle! That looks easy and so delicious! This looks amazing! I love how you used the jar! Super simple and so good. I’ll have to try this. Hmmm this looks delicious! easily made gluten free as well! I love the presentation. Thank you for sharing this dessert recipe with us.